Passed away peacefully at the Coleman Care Centre in Barrie on Saturday, March 16, 2019. Cora Sweeney (nee Lambie) of Sandy Cove, formerly of Elmvale in her 99th year. Beloved wife of the late Lloyd Sweeney. 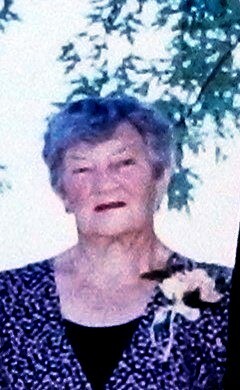 Dear mother of Janice Hazelwood of Innisfil and Terry (Gloria) Sweeney of Victoria Harbour. Loved grandmother of John and Lisa (Russ) and great grandmother of James, Austin, and Patricia. Sister of the late Frances Beardsall, James Lambie, and Bob Lambie. Friends may call at the Lynn-Stone Funeral Home in Elmvale from 12:30 pm -1:30 pm on Thursday, March 21. Funeral service in the chapel on Thursday, March 21 at 1:30 pm. Cremation with spring interment in Elmvale Cemetery. Memorial donations to the Coleman Care Centre in Barrie would be appreciated.